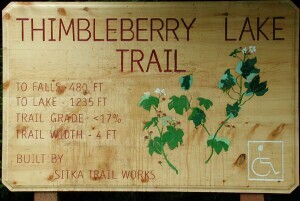 A well developed trail accessible by persons with disabilities leads from the parking lot to Thimbleberry Lake. A much less developed trail continues around Thimbleberry Lake over a low pass to connect with Heart Lake Trail. Drive out Sawmill Creek Boulevard from downtown three or four miles to a large turnout/parking lot on the left side of the road. (If you see Whale Park, you have gone too far.) The trailhead sign is quite visible along the edge of the parking lot closest to town. Thimbleberry Falls is easily seen from the trail. Thimbleberry Lake has a boat or two that can be used on a first come first served basis (you may want to bring your own oars).